ioBridge makes it easy for professionals and enthusiasts to monitor and control nearly anything via their smart phone or web app using our general purpose web gateways. ioBridge offers a range of web gateways or modules that connect products and devices to the Internet. Our standard web gateways require an Ethernet connection and custom Wi-Fi. Zigbee and other wireless options are also available. Gateway technology provided with ioBridge is available as off-the-shelf units that may be purchased through our online store or as technology that may be integrated into products to Internet-enable them. ioBridge’s gateway technology is cost-efficient and easy-to-use, and it typically does not require changes to network settings or firewalls. ioBridge web gateways include the original ioBridge IO-204, the IO-201 Wi-Fi, the Gamma Pro and the Gamma Pro Wi-Fi. Ethernet or Wi-Fi options are available, allowing for plug-and-play configuration and operation. Easily attach sensors or actuators to the Internet in seconds. Access a comprehensive range of ioBridge-manufactured and third-party sensors and actuators that are compatible with ioBridge web gateways. These sensors and actuators are typically small circuits that plug directly into one of the web gateway channels. ioBridge classifies its sensors and actuators into two types: Function Boards that use the analog input or digital inputs and outputs, and Smart Boards that extend the functionality of the web gateway. Function boards are small plug-in circuits that use an I/O channel in its native I/O mode. It may use one or more signal lines (digital in, digital out, analog in). Function boards are typically paired with a matching dashboard display or widget, which is tailored to suit the function. An ioBridge Smart Board extends the functionality of the host module and provides more complex functionality than function boards. 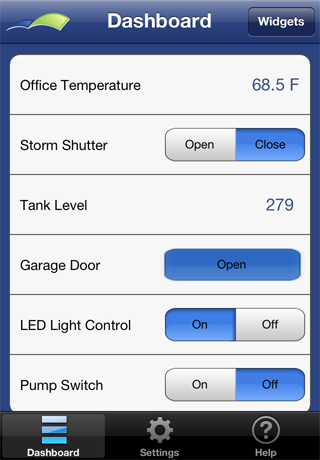 ioApp by ioBridge, Inc. is a free application that lets ioBridge users access their ioBridge Widgets conveniently from their iPhone or iPod Touch. Simply download and launch ioApp to rearrange your widgets and customize labels. Download ioApp at no cost on the App Store. Click Here to view the ioApp tutorial. 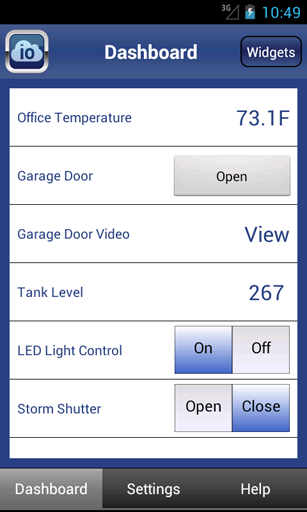 ioApp by ioBridge, Inc. is a free application that lets ioBridge users access their ioBridge Widgets from their Android device. ioApp supports both ioBridge.com and ioBridgePro.com user accounts. Simply download and launch the app to customize your dashboard by rearranging your widgets or creating your own widget labels. ioApp is available at no cost on Google Play. Click Here to view the ioApp tutorial. ioBridge offers a complete line of products and services specifically designed for professionals. Our off-the-shelf modules and services provide exceptional flexibility and capability, assisting in the implementation of sophisticated Internet-enabled monitoring, control, and logging solutions without having to write custom software or develop custom web pages. More more information please see our documentation, tutorials or frequently asked questions.